Scotland’s biggest moment in over 300 years is now upon us. After two years of very hard work, a fact of which I am enormously proud and something I shall cherish for the rest of my life, finally the campaigning comes to an end at 10pm on the 18th September. What emerges in the early hours of the 19th will affect me, you and our children and our children’s children. Whatever the result, the decision will become enforceable and irreversible-either way we must emerge as a nation united and move forward. The future of this nation is not for the politicians to decide but by the people for the people. I believe that our future can be a very bright one, unfolding tremendous potential that can provide Scotland with a very strong financial lead. Imagine if we were to raise our hourly productivity by just 0.3% per annum above the UK growth rate our tax revenues could be £2.4 billion higher by 2029-30. Put it in another way this equates to the current revenue from non-domestic rates. So by way of illustration, with this extra cash the government of the day could technically abolish business rates all together as an extension to the current policy of the Business Bonus Scheme introduced by the current Scottish Government which has helped thousands of small businesses, sometimes to the extent of survival from closure. Alternatively, also without damaging public services, the capital investment in hospitals, roads etc could be doubled without the need to raise taxes. We can only enhance our economic growth and increase productivity if we have full independence which can be the catalyst to generate more business activity. Our financial strengths are not in doubt nor our right to use the Sterling, as these matters have been publicly admitted by our opponents who have confirmed Scotland has the potential to be a very successful country, in fact the seventh wealthiest country in the world to be precise. The philosophy behind the case for independence, however, is not just about financial strengths or having full control of fiscal powers in our own hands. Although a very important part, it should be regarded as the means to accomplishing many other very important goals. Tackling inequality and reducing poverty is the start of building a new Scotland. We need to be divorced from Westminster to introduce policies to reduce income inequality. Having control over taxation and welfare is therefore vital. Having even one child going hungry is unacceptable never mind one hundred and fifty thousand of them. We must build on the principle that free education and access to free medical is the basic human right of every citizen of our country. We must ensure that every worker, especially those low skilled workers, is paid at least the living wage. But we must make it our responsibility to regularly review the level of living wage. If we vote no then there is no change. A no vote means bigger doses of the unjust and unfair policies from the likes of Ian Duncan Smith. It means Westminster will continue to rule over us, its governments-the ones we will never vote for-will continue to drain us of our hard earned money and natural resources. It will mean its foreign policy will continue to drag us into wars and occupations, both illegal and inhumane. There is also another inhumane matter. And that is Trident. An independent Scotland will not play host to weapons of mass destruction but we can remove them on the 18th of September with a simple cross next to “YES”. There is also the very serious threat of Nigel Farage as the next Deputy Prime Minster as UKIP gains momentum sufficient enough for the Tories to seriously consider a power share with it. A no vote means our block grant, which has already been cut by nine percent since 2010 will continue to be slashed as is the UK Government’s plans for the next five years until 2019. These cuts are set to be bigger than nine percent. The effect of these cuts is obvious as the Scottish Government will face difficult decisions on where best to make cuts in public spending. Without a doubt there will be numerous challenges facing us in an independent Scotland but they will be our challenges. No matter how hard the road ahead, an independent Scotland will be a land of equal opportunity and entitlement to live free of discrimination and prejudice. It will be where entitlement to public services and to a standard of living that as a minimum secures dignity and self-respect. That is the kind of country we must strive to live in and that is the kind of country we can make Scotland into; the envy of the world. But we can only do so if we vote Yes-once in a lifetime opportunity, one that we cannot afford to miss. No regrets. Last night, a Pakistani based media news channel broadcasted a programme around the views of Scots Asians and the Scottish Referendum which takes place later this week, Thursday 18 September. The programme was ARY News Special and transmitted at 9.05pm on the ARY News Channel. I am writing this post as a concerned individual who sees herself with a Pakistani heritage but who was born in England and resides in Scotland. “Yes vote will mean a racist Scotland as Scots are illiterate and not as educated as English”. I have highlighted this as totally unacceptable and want the Labour Party/ Better Together campaign to retract this statement made by a card carrying member of their party and friend of Anas Sarwar. Knowing that this statement was made whilst manning a stall in the most ethnically diverse wards in Scotland is appalling and undermines decades of work done to welcome citizens of the world to Scotland. 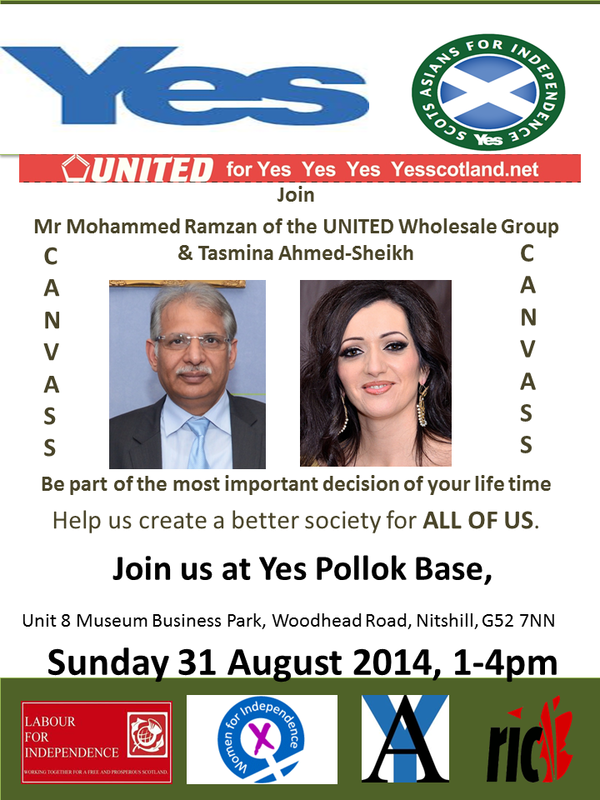 Scots Asians for Yes are part of a broad campaign which is inclusive of all stratas of society and we reject in all totality the statement that was made by Mr Mirza and want the Labour Party to issue an unequivocal apology for the distress caused to all who listened to the programme and the views of its members. Below are some statuses I have unashamedly copied from my good friend and brother Irfan Rabbani as they touch a cord that all grassroot activists will be feeling – those of us who have worked tirelessly over the last nearly two years. Our parents came to a new land not knowing in every certainty necessarily what they would find. However they came in hope in search of improving their and our lives. They aimed for better…in essence that is what is at stake here. We dont have every answer but we STRIVE with hope for better. A better life, and a fairer more just society. Our elders took that bold step for us their children…let us take a bold step for our children. “For those who haven’t for whatever reason haven’t/couldn’t till now – it’s fine…there are legends who have devoted years, some a lifetime..use what they have done to energise you. With less than 7 days to go they have given you, us the opportunity to make history. Let’s get out there and make it happen with everything, anything we can do. A street, a few neighbours, anything. This is the people’s time…show the politicians who this is about: the people…For once a political movement HAS been about the people. THE YES campaign has been about the people…no has been about and continues to be about the self serving. Another great debate organised by FOSIS Scotland and chaired very well by Zara Sultana. 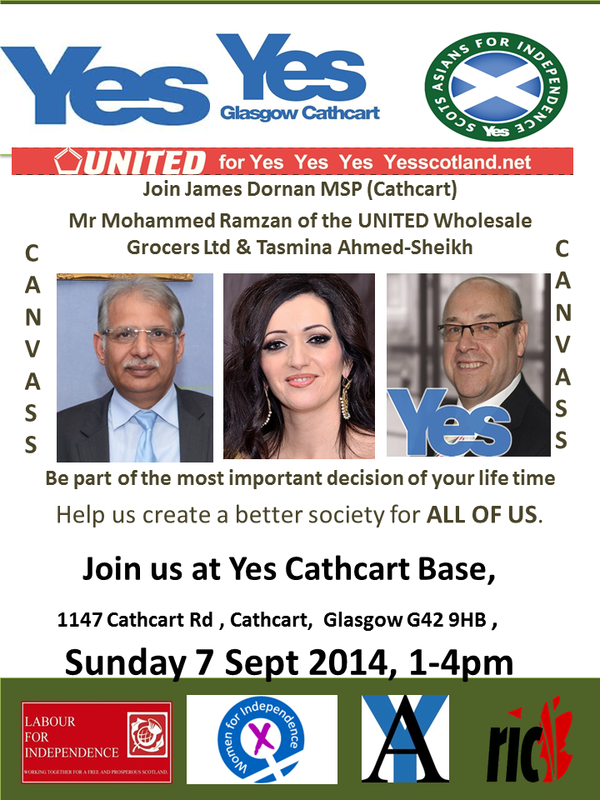 Speakers for Yes Scotland are Tasmina Sheikh and Graham Campbell, and the speakers for the Better Together campaign were Shiraz Ahmed and Pauline McNeill. 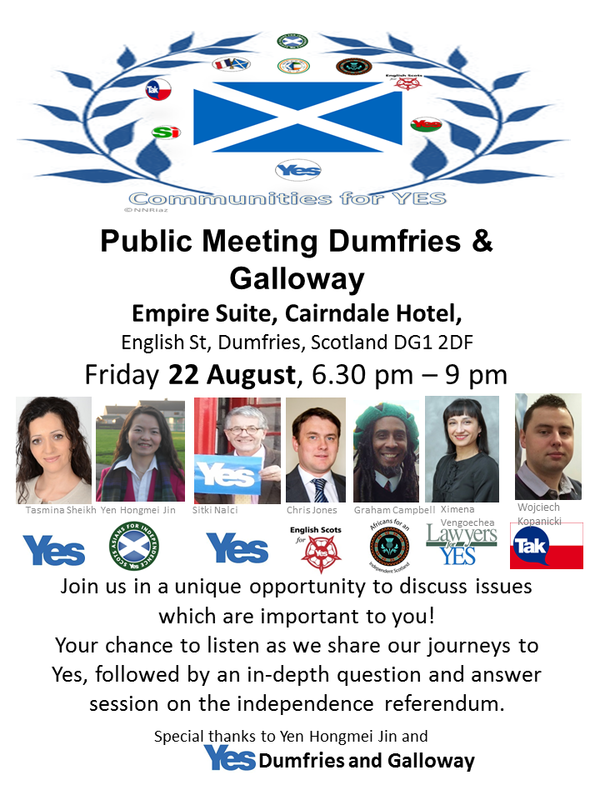 A high calibre panel but off course both Graham and Tasmina did incredibly well. It is a huge pleasure and honour to be asked to write a few words about such a great personality, my grand dad, the late Bashir Ahmad. Bashir Ahmad made history as the first Asian and Muslim member of the Scottish Parliament. He was a true patriot for his adopted land of Scotland. Brought up in Pakistan, Bashir moved to Scotland when he was 21 years old and his first job was a bus conductor. He went on to become a successful businessman and was elected president of the Pakistan Welfare Trust five times. In 2003 he was elected to Glasgow city council for the Pollokshields East ward and in 2007 he joined the Scottish Parliament as a regional MSP for Glasgow. Bashir served on the cross party groups for Carers; Human Rights and Civil Liberties; Older People, Age and Ageing; Palestine; and Tartan Day. He was also a member of the Public Petitions Committee. 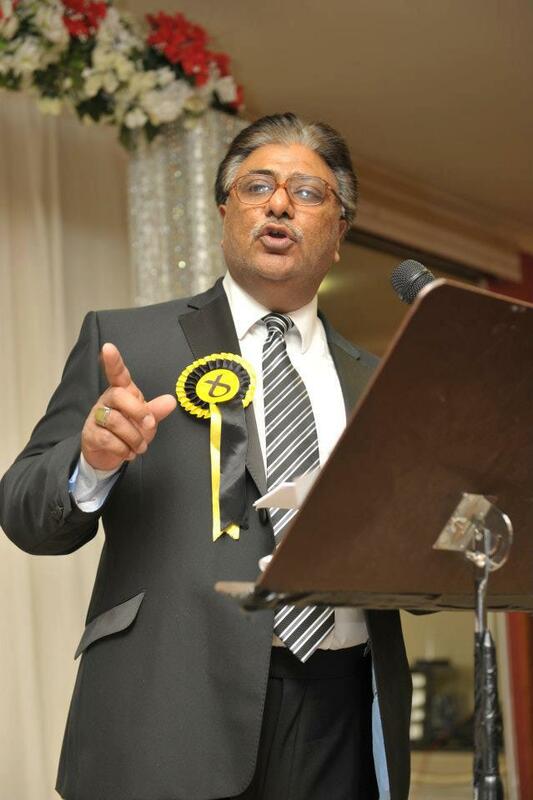 As well as political interests, Bashir was an active member of the Asian and Muslim communities in Glasgow. Above all I will always remember my grand Dad for his fun loving nature, exemplary manners, warmth and hospitality. He has inspired me greatly and has left a legacy that I hope one day I will have the opportunity to continue. 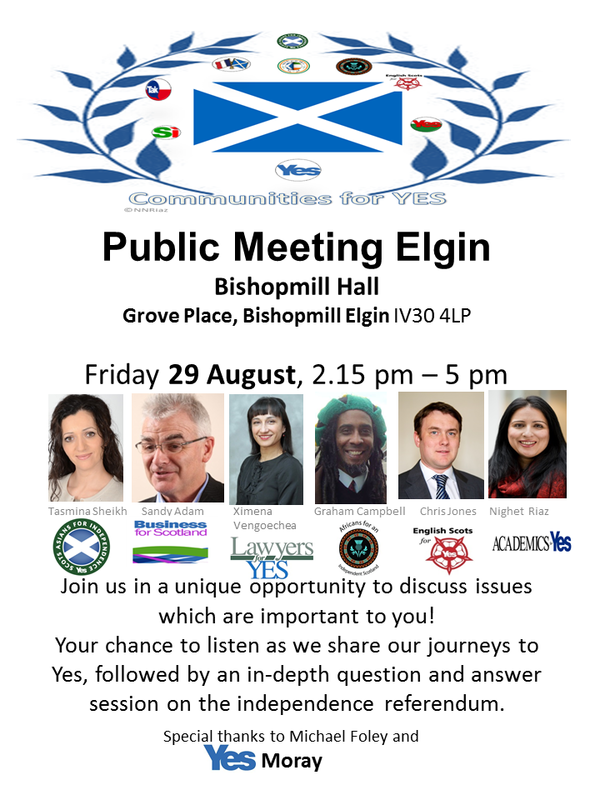 After a very successful Communities for Yes in Stirling, please find details of future events.